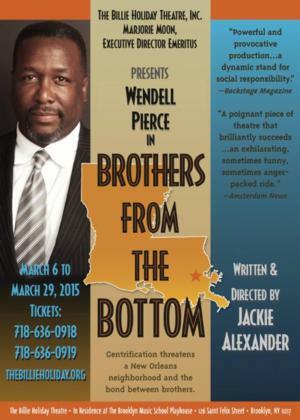 The Billie Holiday Theatre is kicking off a two-year residency with a high profile run of the play Brothers from the Bottom, starring actor and TONY Award-winning producer Wendell Pierce (SELMA, “Treme,” “The Wire”). The cast also features two-time Emmy Award winner Kevin Mambo, who played the title role in Fela! on Broadway and recently appeared in the critically-acclaimed Fortress of Solitude, Toccarra Cash, Thaddeus Daniels, Wendell Franklin and Megan Robinson. The play, written and directed by BHT artistic director Jackie Alexander, will run March 6th – 29th at the Brooklyn Music School Playhouse, 126 Saint Felix Street between Hanson and Lafayette, in the heart of the BAM Cultural District. Below is a previews promo code BFTB for $5 off general admission (regularly priced at $30). Thanks to a special partnership with the Brooklyn Music School Playhouse, The Billie Holiday Theatre (BHT) will present their acclaimed productions to Brooklyn’s flourishing Downtown Cultural District, as their award-winning theatre home in Bed-Stuy’s Restoration Plaza undergoes a multi-million dollar facelift. Brothers from the Bottom writer and director Jackie Alexander is a prolific award-winning actor, writer, producer and director for theater and film. BHT named Alexander artistic director in 2013 after devoting its entire 2010-2011 season to Alexander’s work; commissioning him to write three new plays, one of which was Brothers from the Bottom; and making him the only playwright in the forty-two year history of the theatre to receive such an honor. Original Music: Edward Anderson and Darrell Lavigne (Bleu Orleans); Set Design: Felix Cochren (Broadway credits: Amen Corner, Inacent Black, Home);Assistant Set Designer: Patrice Davidson; Costume Design: Helen Simmons-Collen; Lighting Design: Joyce Liao; Sound Design: Douglas Forbes; Stage Manager: Avan Littles. The Bedford Stuyvesant Restoration Corporation is invested in forward-thinking, provocative and relevant work and partnerships with world-class artists and institutions, such as Wendell Pierce and the Brooklyn Music School Playhouse. The Restoration Center for Arts and Culture is dedicated to promoting arts and culture in Brooklyn with a range of arts programming, including a multidisciplinary youth arts academy, several professional dance company residencies and the Skylight Gallery with exhibits curated by renowned artists. 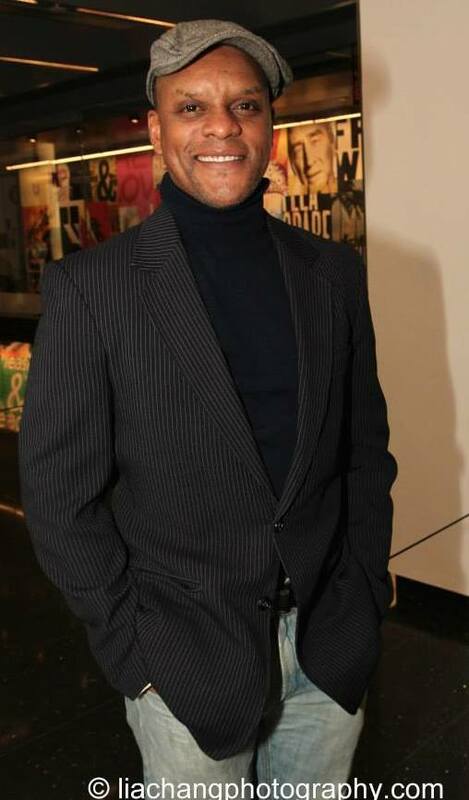 Photos: National Black Theatre Festival 2013; NBTF runs August 3-8, 2015 and will include Act III – A Celebration of Life Reception saluting the late theatre icon Garland Lee Thompson, Sr. 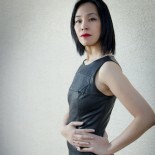 This entry was posted on February 18, 2015 by Lia Chang in African American Artists, Entertainment, New York, Theater and tagged Backstage Pass with Lia Chang, BAM Cultural District gentrification, Brooklyn Music School Playhouse, Brooklynites, Brothers from the Bottom, Downtown Cultural District, Jackie Alexander, Kevin Mambo, Lia Chang, Megan Robinson, SELMA, Thaddeus Daniels, The Billie Holiday Theatre, The Wire, Toccarra Cash, Treme, Wendell Franklin, Wendell Pierce.